The 2019 Australian Grand Prix (formally known as the Formula 1 Rolex Australian Grand Prix 2019) was a Formula One motor race that was held on 17 March 2019 in Melbourne, Victoria. 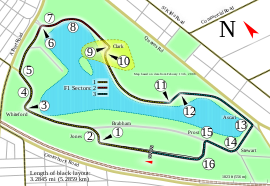 The race was contested over fifty-eight laps of the Melbourne Grand Prix Circuit and was the first round of the 2019 FIA Formula One World Championship. The race marked the eighty-third race in the combined history of the Australian Grand Prix—which dates back to the 100 Miles Road Race of 1928—the twenty-fourth time the event was held at the Albert Park circuit and the thirty-fifth time the Australian Grand Prix formed a part of the Formula One World Championship. Lewis Hamilton entered the round as the defending World Drivers' Champion and his team, Mercedes, are the defending World Constructors' Champions. Hamilton got pole position for the race equalling the record for most poles at one Grand Prix (8), but it was his Mercedes team mate Valtteri Bottas who won the Grand Prix from second on the grid. Federation Square hosted the first Formula One season launch. The Australian Grand Prix was officially confirmed as the first of twenty-one races of the 2019 Formula One World Championship at an FIA World Motor Sport Council meeting in Paris in December 2018. The race took place at the fifteen-turn, 5.303 km (3.295 mi) Melbourne Grand Prix Circuit in Melbourne, Victoria on 17 March 2019. Melbourne's Federation Square hosted a season launch event, the first of its kind for the sport, in the week before the race. Race Director Charlie Whiting died suddenly in the week before the race, so Deputy Race Director Michael Masi was named as Whiting's temporary successor. Local officials were appointed to fill Whiting's additional roles until a long-term appointment could be made ahead of the Bahrain Grand Prix. 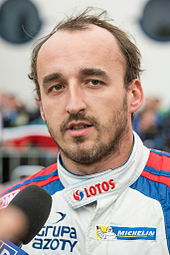 Robert Kubica returned to Formula One after suffering life-threatening injuries in a 2011 rallying accident. Twenty drivers representing ten teams entered the race. Alfa Romeo Racing made their return to the sport, replacing the Sauber F1 Team as part of a sponsorship deal that started in 2018. Racing Point also made their début as an independent constructor, having acquired the assets of Sahara Force India team and having competed under the Force India name in 2018. Alexander Albon, Lando Norris and George Russell all made their competitive débuts. Meanwhile Antonio Giovinazzi, Robert Kubica and Daniil Kvyat all returned to the championship. Tyre supplier Pirelli provided teams with an intermediate range of tyres for the race. Under rules introduced in 2019, Pirelli changed the designations of their tyres to rate the hardness of the compounds, with "C1" being the hardest and "C5" the softest. The colour-coding system used in previous years was simplified so that the white-coloured tyre wall represents the hardest compound available at any Grand Prix, a yellow tyre wall the medium compound and the red tyre wall the softest tyre. Pirelli nominated the C2 tyre as the white-banded hard compound, C3 as the yellow-banded medium and C4 as the red-banded soft. The race saw the introduction of a change to the points system. The system in use since 2010 will be retained, but drivers who set the fastest lap could be awarded a bonus point provided that they finish the race inside the top ten. The bonus point is also awarded to the constructor of the driver that set the fastest lap as well. Lewis Hamilton was fastest in all three practice sessions. The sessions ran uninterrupted apart from an incident that saw Alexander Albon spinning out at turn 2 and hitting the wall during the first practice session. Albon was able to return to the pits for repairs. In the third practice session McLaren released Lando Norris into the path of Robert Kubica which resulted in the McLaren team receiving a fine. The first qualifying session passed without incident until the final couple of minutes when Robert Kubica hit the wall coming out of turn 10 giving him a puncture, he later attrbuted this to a sudden increase in grip. The drivers knocked out in Q1 and finishing qualifying in sixteenth to twentieth respectively were Lance Stroll, Pierre Gasly, Carlos Sainz, George Russell and Robert Kubica with Charles Leclerc setting the fastest lap time of the session. Gasly being knocked out came as a particular surprise and put his early exit down to unexpected track evolution. Sainz was also disappointed with his early exit from qualifying, especially considering his team mate qualified in eighth, Sainz attributed his early exit to having to slow down after Kubica got a puncture in front of him forcing him to slow down on his qualifying lap. The second qualifying session passed without incident and resulted with Nico Hülkenberg, Daniel Ricciardo, Alexander Albon, Antonio Giovinazzi and Daniil Kvyat being knocked out and finishing qualifying ranked eleventh to fifteenth respectively with Lewis Hamilton setting a qualifying lap record to end the session fastest. The surprises came from the two Renaults of Ricciardo and Hülkenberg being knocked out after being considered as the fourth fastest team following pre season testing and from Lando Norris getting in to the top ten. For the third qualifying session all of the teams were able to have two attempts to set the fastest time, after the first attempt it was Valtteri Bottas who was leading having beaten the qualifying lap record which Hamilton had set in Q2, Bottas was followed by Hamilton and Sebastian Vettel. During the second attempt in Q3 Hamilton improved his time by half a second to beat Bottas' lap record. As no one else improved their time sufficiently to beat any of top three it was Lewis Hamilton who took pole position followed by Valtteri Bottas and Sebastian Vettel completing the top three. The top ten was completed by Max Verstappen, Charles Leclerc, Romain Grosjean, Kevin Magnussen, Lando Norris, Kimi Räikkönen and Sergio Pérez. In his post qualifying interview Leclerc confessed that he wasn't happy with his performance in saying that he thought he was able to get into the top three but was unable to due to a untidy lap. Meanwhile Haas said they were delighted with their performance getting their cars into sixth and seventh positions. Valtteri Bottas started the race well from second place, and had the lead going into turn one. Further back, Daniel Ricciardo was contesting a position with Sergio Perez, in which Ricciardo had to drive on the grass on the right side of the track to avoid Perez, however Ricciardo drove over a sunken bit of tarmac causing his front wing to fall apart, spilling debris around that part of the track and causing him to drop to last as he drove round with no front wing before pitting for a replacement. Max Verstappen was passed by Charles Leclerc who then proceeded to battle his teammate Sebastian Vettel, Vettel kept Leclerc at bay in 5th and Leclerc was reovertaken by Verstappen. Robert Kubica came into the pits on lap 1 after sustaining front wing damage. On lap 9, Carlos Sainz pulled over in his McLaren at the entrance to the pits, with a large plume of smoke emerging from the rear of his car, which was followed by an onboard fire. Kimi Räikkönen pitted on lap 13 whilst Pierre Gasly struggled to make progress from P17, moving up only to P12 despite being in a significantly faster car than those in front of him. Nico Hulkenburg and Perez then pulled into the pits in search of an undercut, followed by Vettel who put on the medium tyres. Lewis Hamilton pitted a lap later onto the same tyre compound, and he emerged ahead of Vettel. Romain Grosjean then pitted but an issue on the front left tyre caused him to lose three positions during his pit stop. Antonio Giovinazzi went wide on the approach to turn 13, allowing Grosjean to pass through. Bottas, the race leader, made his pit stop on lap 23, Verstappen followed suit three laps later and Leclerc pitted from second place on lap 29. Daniel Ricciardo retired as a precaution following the lap 1 incident. Verstappen passed Vettel on lap 31. Grosjean pulled over on to the run off area on the penultimate corner, after his front left wheel came loose. Daniil Kvyat went wide trying to pass Lance Stroll at turn 3 on lap 38. Bottas retook the fastest lap and won the Grand Prix by over 20 seconds to his teammate Hamilton. They were followed by Verstappen in third and the two Ferrari cars trailing in fourth and fifth. Bottas became the first driver to win a bonus point for the fastest lap of the race since Maurice Trintignant at the 1959 United States Grand Prix. ^ "2019 Australian Grand Prix Attendance". Speedcafe.com. Speedcafe.com. 17 March 2019. Retrieved 17 March 2019. ^ "Australia". formula1.com. Formula One World Championship Limited. Retrieved 16 February 2019. ^ "Grands Prix Australia". StatsF1.com. Retrieved 1 March 2019. ^ Benson, Andrew (28 October 2018). "Lewis Hamilton equals Juan Manuel Fangio with fifth F1 title". bbc.com. BBC Sport. Retrieved 16 February 2019. ^ "Valtteri Bottas wins Australian GP after Lewis Hamilton overtake". 17 March 2019. Retrieved 21 March 2019. ^ "Statistics Drivers - Pole positions - By Grand Prix". StatsF1.com. Retrieved 21 March 2019. ^ Herrero, Dan (30 January 2019). 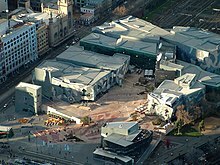 "Federation Square to host first Formula 1 season launch". speedcafe.com. Speedcafe. Retrieved 16 February 2019. ^ "FIA Statement - Charlie Whiting". fia.com. Fédération Internationale de l'Automobile. 14 March 2019. Retrieved 14 March 2019. ^ "Charlie Whiting: F1 race director dies aged 66 on eve of season-opener in Melbourne". BBC Sport. BBC. 14 March 2019. Retrieved 14 March 2019. ^ a b Howard, Tom; Coch, Mat (14 March 2019). "Australian Michael Masi appointed F1 race director". speedcafe.com. Speedcafe. Retrieved 14 March 2019. ^ "Sauber F1 team renamed Alfa Romeo Racing". motorsport.com. Motorsport Network. 1 February 2019. Retrieved 16 February 2019. ^ "Force India become Racing Point for 2019". formula1.com. 1 December 2018. Retrieved 16 February 2019. ^ "Albon to drive for Toro Rosso in 2019". scuderiatororosso.redbull.com. Scuderia Toro Rosso. Retrieved 16 February 2019. ^ "Lando Norris to drive for McLaren in 2019". mclaren.com. McLaren F1 Team. Retrieved 16 February 2019. ^ "How Russell sealed a 2019 drive with Williams". formula1.com. Retrieved 16 February 2019. ^ Collantine, Keith (25 September 2018). "Giovinazzi will replace Ericsson at Sauber in 2019". racefans.net. Retrieved 16 February 2019. ^ "Robert Kubica: Polish driver to make F1 comeback with Williams in 2019". bbc.co.uk. BBC Sport. 22 November 2018. Retrieved 16 February 2019. ^ "Daniil Kvyat to return to Toro Rosso for 2019 season". formula1.com. 29 September 2018. Retrieved 16 February 2019. ^ Herrero, Daniel (6 March 2019). "F1 teams' tyre picks for Australian Grand Prix revealed". speedcafe.com. Speedcafe. Retrieved 6 March 2019. ^ Cooper, Adam (24 May 2018). "Pirelli asked to simplify tyre compound names for 2019 F1 season". autosport.com. Motorsport Network. Retrieved 6 March 2019. ^ Coch, Mat (29 August 2018). "Pirelli to simplify F1 tyre compounds from 2019". speedcafe.com. Speedcafe. Retrieved 6 March 2019. ^ "What Pirelli tyre compounds have the teams and drivers picked for Australia?". formula1.com. Formula One Management. 6 March 2018. Retrieved 6 March 2019. ^ "F1 to award point to driver who sets fastest lap in a grand prix". BBC sport. BBC. 11 March 2019. Retrieved 11 March 2019. ^ "Australian Grand Prix 2019 FP1 report: Hamilton, Vettel and Leclerc split by 0.07s in opening session in Australia". Formula1.com. Retrieved 15 March 2019. ^ "Australian Grand Prix 2019 FP2 report: FP2: Hamilton heads Bottas as Mercedes go clear of the field". Formula1.com. Retrieved 15 March 2019. ^ "MUST-SEE: Rookie Albon the first to hit the barriers in 2019". Formula1.com. Retrieved 15 March 2019. ^ "McLaren fined for unsafe release during FP3". Formula1.com. Retrieved 16 March 2019. ^ "Sudden improvement in grip led to Kubica's brush with the wall in qualifying". Formula1.com. Retrieved 16 March 2019. ^ a b c d "Formula 1 Rolex Australian Grand Prix 2019 – Qualifying". Formula1.com. 16 March 2019. Retrieved 16 March 2019. ^ "Red Bull and Gasly caught out by track evolution as they slump to Q1 exit". Formula1.com. Retrieved 16 March 2019. ^ "Sainz rues bad luck as Kubica puncture costs him dear". Formula1.com. Retrieved 16 March 2019. ^ "Australian Grand Prix qualifying 2019: 'Renault will sneak into the points' predicts Daniel Ricciardo despite Q2 exit". Formula1.com. Retrieved 16 March 2019. ^ "Australian Grand Prix qualifying 2019: Lando Norris: 'Q3 definitely not what McLaren were expecting'". Formula1.com. Retrieved 16 March 2019. ^ "What to Watch For in the 2019 Australian Grand Prix: 5 key storylines for Sunday's race". Formula1.com. Retrieved 16 March 2019. ^ "Australian Grand Prix 2019 qualifying - Charles Leclerc 'not happy' with performance after Melbourne qualifying". Formula1.com. Retrieved 16 March 2019. ^ "Haas delighted with sixth and seventh in Australia qualifying". Formula1.com. Retrieved 16 March 2019. ^ "Jolyon Palmer's Analysis: How Bottas jumped Hamilton at the start of the 2019 Australian Grand Prix". Formula1.com. Retrieved 21 March 2019. ^ "F1 Inbox after the 2019 Australian Grand Prix: Your questions on Bottas, Ricciardo and Ferrari answered". Formula1.com. Retrieved 21 March 2019. ^ a b "Daniel Ricciardo on his race-wrecking start incident in the 2019 Australian Grand Prix". Formula1.com. Retrieved 21 March 2019. ^ a b c d e "Watch RACE HIGHLIGHTS of the 2019 Australian Grand Prix". Formula1.com. Retrieved 21 March 2019. ^ a b "MUST-SEE: Watch how close Ferrari came to disaster in Australia race start". Formula1.com. Retrieved 21 March 2019. ^ "Kubica rues 'complicated' F1 return after sustaining start damage". Formula1.com. Retrieved 21 March 2019. ^ "WATCH: Smoking Sainz becomes first driver to retire in 2019". Formula1.com. Retrieved 21 March 2019. ^ a b c d "2019 Australian Grand Prix - Pit stop summary". Formula1.com. Retrieved 21 March 2019. ^ a b "Australia 2019 - Lap by lap". StatsF1.com. Retrieved 21 March 2019. ^ "Wolff backs Red Bull to be in championship battle after Honda gains". Formula1.com. Retrieved 21 March 2019. ^ a b "Australia 2019". StatsF1.com (in French). Retrieved 21 March 2019. ^ "Australian Grand Prix 2019: Guenther Steiner curses 'deja vu' for Haas after Romain Grosjean's loose wheel retirement". Formula1.com. Retrieved 21 March 2019. ^ a b c "Formula 1 Rolex Australian Grand Prix 2019 – Race Result". Formula One. 17 March 2019. Retrieved 17 March 2019. ^ a b "Formula 1 Rolex Australian Grand Prix 2019 – Fastest Lap". Formula One. 1 April 2019. Retrieved 1 April 2019. ^ "Valtteri Bottas dominates Australian Grand Prix to win Formula One opener". Guardian. 17 March 2019. Retrieved 20 March 2019. ^ a b "2019 Australian Grand Prix - Championship points". Fédération Internationale de l'Automobile. 17 March 2019. Archived from the original on 18 March 2019.